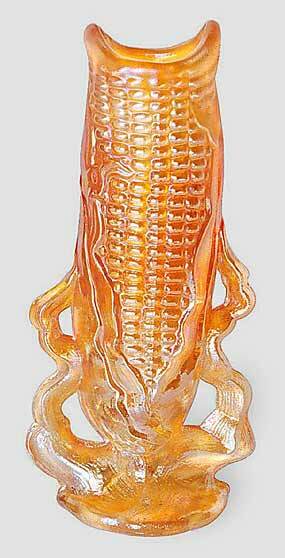 Lustre Corn was first produced around 1905 by Dugan in flint (white), green, blue, and canary (yellow) opalescent. Marion Hartung named the pattern Corn Vase in her “Opalescent Pattern Glass” book. The tops on all the old examples extend into two long points. It was reproduced by L. G. Wright sometime after 1950. The repros have a top that's straight across. There are probably other differences as well, but the top provides the easiest differentiation. This marigold example may be the only iridized example known. It sold in 2010 for $6,000.